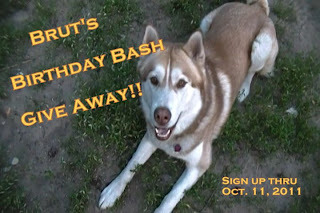 24 PAWS OF LOVE: Brut's Birthday Bash Give Away!! hmmmmm...we are thinking the Beef and Chicken sounds pretty good! We will have to go over and check out their website! Thanks!! Happy Birthday, Brut - we hope you have a wonderful party on your special day. We haven't had those treats but they all sound delicious. We think we would like the sweet potato and chicken best. Since we're cats we'll pass on the contest, but I wanted to stop by and say Happy Birthday Brut!!! Happy Birthday Brut! I would love to try some of those treats! Oops, I would like to try the Sweet Potato and Chicken! We think the Beef Liver & Chicken Liver Freeze Dried Pet Treats sound delish! wooooo! Happy birthday Brut! Pawty like a rock star!! We think all the flavors look yummy, harrooo! Too bad I can't join in your contest but my food allergies keep my Human from letting me play. Have fun. Our girls are voting for Sweet Potato and Chicken! Happy Birthday to Brut! What a great way to celebrate! How nice of Brut to share on his birthday. Honey would love to win sweet potato and chicken liver terra treats. Since Blogger doesn't seem to capture emails, here's mine: somethingwagging(at)gmail(dot)com. What a great way to celebrate! We're eying the sweet potato and chicken too! I'll wait til the 11th to wish Brut a Happy Birthday:) Those treats sound delish but of course I can't enter as I'm far far away:( I know the winner will enjoy them. Sweet potato and chicken seems a popular choice! Beef and Chicken sounds good to me. Oh, a birthday bash - how fun! Happy Birthday wishes to you Brut!!! Yummm...the Five love their sweet potato, so I'll pick that! What a great way to celebrate handsome Brut's birthday! We love treats...Yay! Those Sweet Potato and Chicken Liver ones sound divine!! OoH what fun! Can't wait to celebrate Brut's Barkday on da 11th! I luvs sweet potato and chicken too! **Drool*** They all look yummy but if I had to pick I would pick the Sweet Potato and Chicken. Just dropping by to invite you to add this post to our Tasty Tuesday blog hop tomorrow! We can't enter because we're up in Canada, but we think these treats are very yummy!